As part of Aldi’s summer water product line, the grocer stocks a most curious thing: a full boat packed in a very small cardboard box. 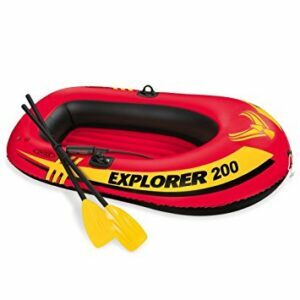 The Intex Explorer 200 Boat Set is not an Aldi exclusive: it can be found many other places online, including Amazon. What does set the Aldi version apart is that it is the cheapest we’ve seen this boat: $10.99. The package includes an air pump, two aluminum oars with retainer rings, a grab rope that goes on the front of the boat, and a repair patch. According to Aldi, the boat comes with a 2-year warranty. The boat is about 73 inches long (about 6 feet), 37 inches wide (about 3 feet), and 16 inches deep (1 foot 4 inches). Keep in mind that this is an inflatable boat, so the user space will be smaller than those dimensions. Between the size and the weight capacity — 210 pounds — this is a boat for a single person or perhaps an adult and a small child. We spent some time talking with someone who has used the boat, mostly on a small lake under calm conditions. He told us that the boat, while easy enough to inflate, can be hard to maneuver in the water at first, probably owing to the fact that it is an inflatable boat, not a hard-bodied canoe or kayak. It takes practice. He also said that the boat, not being firm, jiggles a little, not unlike what you would expect a raft to do. We also took a look at some of the user feedback on the Explorer 200 around the Internet. Overall, people appear to be pleased with the boat, although they note that it is designed for one person or one adult and a small child. The most common problem is that the boat can develop holes when branches or other items under the water poke the bottom of the boat, and that may be unavoidable with an inflatable boat. While there’s a learning curve to the Intex Explorer 200, and the boat does have some limitations, it appears to be a serviceable little watercraft for the intrepid lake traveler on a budget or the parent who wants to take a child out onto the water, and it’s generally well-reviewed online. As far as we know, Aldi has the best price of any retailer on it.